We don’t have a great track record for Kidical Mass. 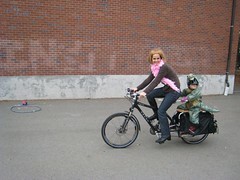 We attempted a Kidical Mass ride in the Spring. But we never made it to the actual ride because we got completely utterly and totally rained out (literally). We’re ready to put that experience behind us and do it all over again in one of the rainiest months in these parts. Because riding with other families en masse is a life experience not to be missed. And because parents are known for their amnesia, especially when it comes to bad times. It’s the main reason some of us end up with more than one baby. The Car Free Days family will attempt another Kidical Mass ride on Saturday. 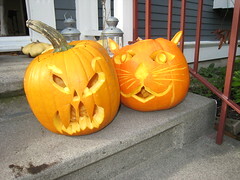 Join us (and the rest of the Seattle family biking crowd) for Kidical Mass, Halloween edition. Get all the details you will ever need at Totcycle. We’ll arrive from the NE. (and will most likely be late cause that’s how we roll). We probably won’t make the start of the ride, but we’ll do our best to meet y’all on the Fremont bridge. This entry was posted in bikes, Events, extravehicular activities, family cycling and tagged halloween, Kidical Mass, Oct 30, seattle. Bookmark the permalink. Your blog makes me so happy. My husband and I run a bike powered business and are so looking forward to having a family. Your site gives me hope that we can do it without a car! Keep up the amazing work.